When Melani and I first met at the tail end of 2011, our lives were at an interesting intersection. I had just recently stopped blogging about online dating and she was on the cusp of a commitment to one full year of online dating — at fifty years old! Yes, believe it. That hot babe in the picture below is not 35, like you might have guessed. Melani is beautiful, inside and out and it has been such an honor to be the one that gets to help tell her story. After a year of dating online and writing about it on her now-offline blog, 1 Year of Online Dating at 50, she spent the following year writing about her life on her personal brand site, MelaniRobinson.com. When she was nearly finished with her book — a retooling of the blog content from 1 Year of Online Dating at 50, it was time to get things set to launch on a new site, with a slicker brand and a better presentation for her content. She got new headshots, I helped her put together a hilarious intro video (seriously, you should check it out!) and I installed the new design. I’m thrilled with how this one turned out and so very grateful to have a client that “gets” me in a way that feels more like a friend than some stuffy, professional relationship. Here’s the screengrab which shows you the responsiveness of the site as well as the slick Genesis responsive menu that I learned about from Ozzy Rodriguez at WPBacon.com. I’m especially excited about the menu icons that we’re using from TheNounProject.com, too. We also moved her site away from GoSloDaddy and onto the zippy, well-supported shoulders of my favorite folks over at Flywheel. Since she’s re-releasing the old 1 Year of Online Dating at 50 content as a book with additional content, we pulled the old blog down and redirected the traffic over to a landing page that will, for now, serve as a space to gather emails in anticipation of the new launch and, when it launches, will serve as the sales page for the book. 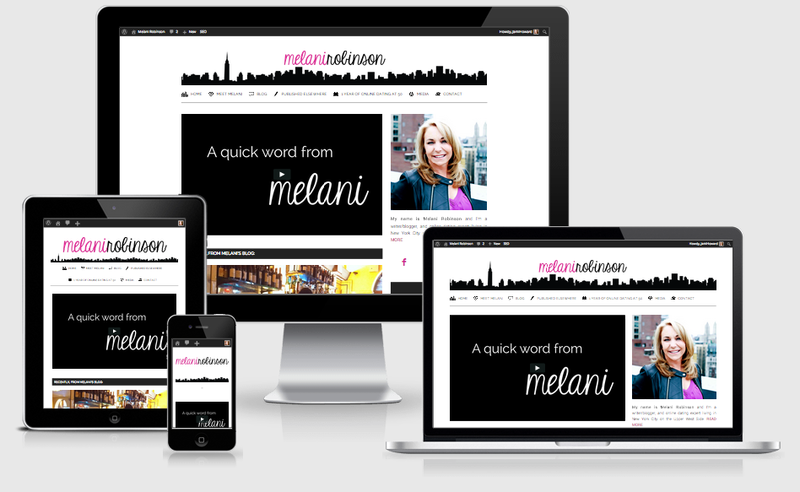 Check out Melani’s new site by clicking here!